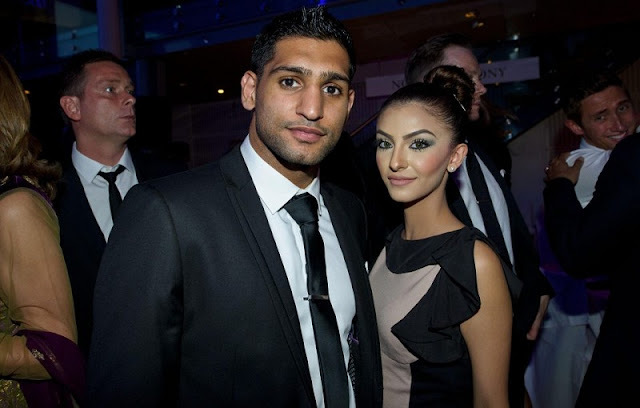 Boxing star Amir Khan has been accused of sending sleazy texts to a single mum in which he called his wife Faryal Makhdoom a 'Kylie Jenner plastic surgery obsessive'. The former champion is alleged to have bombarded the teacher named Sophie with a string of flirtatious messages and urged her to send him raunchy videos. He revealed in the messages to Sophia that his estranged, pregnant wife Faryal had 'an obsession with surgery,' which ruined her looks. Sophia told the Daily Star: 'He said she was good-looking until she started following Kylie Jenner and changing her looks. 'He said she had no need for the work, then added 'nobody would have her for a one-night stand now', which was a rude thing to say'. Khan, an Olympic silver medalist and ex light-welterweight champion, met the school teacher in a hotel car park and began texting her shortly afterwards. As their relationship developed, Khan is said to have begged the mother-of-one to send him sexual videos before backtracking claiming a friend had done it as a joke. Khan and Makhdoom split up earlier in the year following a string of tweets in which the boxer accused fellow Olympian Anthony Joshua of bedding his wife. Makhdoom responded by accusing the star of having been adulterous numerous times during their four-year marriage. While it briefly appeared they would be reuniting, in September, Khan confirmed they are still getting a divorce. MailOnline has approached Amir Khan's representatives for comment. Boxing star Amir Khan has been accused of sending sleazy texts to a single mum in which he called his wife Faryal Makhdoom a 'Kylie Jenner plastic surgery obsessive'. The former champion is alleged to have bombarded the teacher named Sophie with a string of flirtatious messages and urged her to send him raunchy videos.